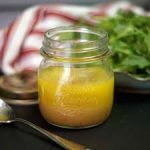 This sauce vinaigrette is a knock-out French style salad dressing that has many uses, including brining olives or using for a marinade. In a mortar and pestle, grind the salt, pepper and garlic together until it becomes a paste. In a small bowl, whisk all the ingredients together, except the oil. Add the oil slowly, whisking continuously. When it has all been absorbed, taste the sauce. Adjust with extra vinegar, salt or pepper to suit your taste. Serve with salads or crudites.Makes about 1 3/4 cups.